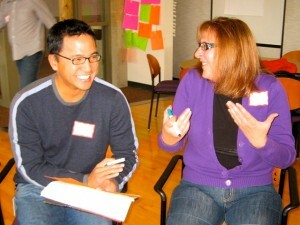 Creative Facilitation Training - SparkFire, Inc.
Want to lead, inspire, and create solutions for all kinds of challenges? We’ve got a proven process that delivers epic results. Learn the secrets and master the skills it takes to design and facilitate productive, engaging brainstorming sessions that produce breakthrough thinking. We’ll share our real-world wisdom, gained from 20 years of experience, teaching you the tricks and tools that work. Our trainings are dynamic. Energizing. Hands-on. You’ll learn techniques you can apply immediately. You’ll receive targeted coaching to boost your confidence. And you’ll dive in with a live brainstorming session, testing your new expertise while solving an actual challenge. You’ll leave with a workbook packed with details that’ll continue to support and inspire, long after your training. We offer programs for individuals and work groups — courses that’ll help you reach peak performance, or create a whole team of rockstar facilitators. And we’ll continue to nurture your newfound skills with our proprietary ebooks and webinars. Go backstage with some of our star performers. Chris is a very passionate and effective leader in the creativity and facilitation field. She conducted two extensive training programs for us and coached 30 individuals to facilitate their own ideation or work sessions. She customized the program to fit our organizational needs, and the results were fantastic. Chris has also lead several concept-ideation sessions for our New Product Development group. You will not be sorry that you hired Chris to facilitate or train your people.